Best time for beginners: May to June and November to December. Although fantastic beginner waves can be had all year round. Philippines surf history is a little vague, with surfing in Philippines first documented in the early 1980s, when surfers Tony Arroza and Steve Jones arrived on the eastern coast of Siargao to score some perfect warm water waves with not a soul in sight! Towards the end of 80’s a surfer called Max Walker found himself setting up home near Tuason Point, with folklore saying that his shack was right on the beach, overlooking the empty peaks. This is where the story gets a little strange, tragically Walker died following a 44-day fast and it was only then, as more foreigners arrived for their share of uncrowded Philippine surf spots, that Max Walker was in fact identified as Mike Boyum, a well-respected and legendary traveller and surfer who had set up the first surf camps at G-Land in Indonesia during the 70’s. The early 90's saw John Callahan head over to show pro surfers Evan Slater and Taylor Knox why a Philippines surf holiday can give you the best waves of your life! They surfed the hollow a-fame peaks of the now known Cloud Nine, with Callahan claiming ownership of naming the break, stating: “I named the break after the local no-melt chocolate bars. Going into town after lunch for a warm Coke and a Cloud Nine was the highlight of our day!" What’s the surf like in the Philippines? The country has over 7,000 islands, but if you are looking at Surfing Philippines waves the area you need to get to is the North West Coastline coastline and the Eastern Pacific Ocean facing coast. Philippines surf holidays are on the rise, and what’s best is that Philippines surf is suitable for all levels of surfers. Philippines surfing can be temperamental and seasonal, one day you can be getting the best waves of your life and the next day it can be flat; it is therefore important to know when are the best times to come to a Philippines surf camp. The East coast, which is the Pacific Ocean side, receives it’s swell from monsoons, low pressure tropical storms and typhoon swells.The first monsoon that arrives in the east coast is the south west monsoon, which fills in in around May time and lasts through to mid-October. The better and more consistent surf, which is obviously more ideal for a stay at a Philippines surf resorts, is during the north-east monsoon or the ‘amihan’, during November to April. The Philippines surf spots can come to life when the typhoon swells roll in from the East of Mindanao and head in a North Westerly direction, hitting the southern Luzon, as well as the islands between Luzon and the Pacific. The West coast of the Philippines is a little more inconsistent than the East coast, but that doesn’t mean you won’t get fantastic waves on your Philippines surf trip! The west coast relies on the winds through the Taiwan Straits during the north-east monsoon season; this swells created by these winds hits the west coast of Luzon, where you can get some of the best beginner surf Philippines offers. Siargao surfing (pronounced shar-gow) is known for its hollow and perfect waves, with the best time to experience your Philippines surf holiday here between September and March, during the north-western monsoon season. The island is tear drop in shape and is made up of different tourist resorts surrounded by incredible white sandy beaches. Philippines surf resorts in Siargao are often described as being like Bali back in the 70’s, with its uncrowded waves, jaw dropping scenery and cheap living that makes for a truly unforgettable Philippines surf experience. 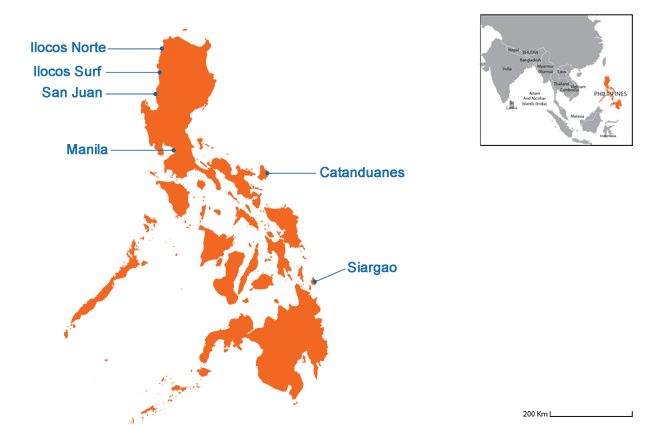 Located along the East coast of the Philippines surrounded by the Pacific Islands. What makes Catanduanes such a popular Philippines surf destination is that it dishes up some of the best beginner surf in the Philippines. For those on advanced and intermediate Philippines surf holidays head to Majestics at Puraran Bay, this is a hollow right hander that breaks over a coral reef, which, when conditions align, is considered one of the best Philippines surf spots as it gives you the best barrel of your life. The largest island and home to the capital, Manila, Luzon is at the north end of the Philippines and it is the west-facing South China Sea coast of Luzon, that benefits from two distinct monsoonal surf seasons which provides fantastic conditions for riders of all abilities. Even if you have never surfed before, Luzon is the place to learn to surf. Philippines surf resorts in this island are centred around a varied surfing landscape, consisting of sharp reefs, point breaks and a mix of white and black sand beaches. The provinces of Ilocos Norte and Ilocos Sur contain an empty coastline of shallow, jagged reefs and fun beach breaks that are perfect for every type of surfer looking to get some uncrowded waves on their Philippines surfing holidays. Pagudpud in Ilocos Norte is truly a sight to behold, with white sand beaches, crystal clear water and picture perfect scenery… in addition to the fantastic waves, of course! Surfing in Luzon is centred around the La Union province. Here the geology mellows provide the perfect set ups for beginner and intermediate surfers who are looking to up their game with a variety of waves on their Philippines surf holiday. San Juan is the beating heart of the areas surf industry, and is renowned as the primary surf beach in La Union; it’s here where the vast majority of tourists and locals head to because of the beautiful and cheap accommodation, lively bars and outstanding restaurants, as well as all the amenities that you would expect in a surf orientated town. Baler on the East coast is often considered the birthplace of surfing in the Philippines. Interestingly, it was first discovered and surfed by the production crew of 1979 Film Classic “Apocalypse Now”, it was only after they went home and gifted their boards to the locals that Philippines surf culture was born. This chilled out Philippines surf town is not only known for its high quality waves that appeal to everyone, from seasoned surfers to complete novices; it’s also rich in cultural history. The Philippines is hot and extremely humid all year meaning suitable gear are shorts, a thin top and flip flops. You should pack a long sleeve top for any transit journeys, as being on the back of a bike can get a bit chilly… by Filipino standards anyway! The Pacific side of the Philippines is subject to two monsoon patterns. The NE monsoon called ‘amihan’,from November to April, will not only bring onshore winds and small wind swell, but also huge amounts of rainfall, making it always advisable to pack in a very thin waterproof. July sees the SW monsoon ‘habigat’ start blowing, which brings less rain and better wind patterns for the Philippines surf spots in this area. Typhoons rarely make landfall this far south, but nothing is impossible, if they are going to arrive it will be between July and Dec. The water is warm all year and fluctuates between 24c and 27c, all you need is board shorts, a rash guard and reef booties. As this is the tropics, make sure you have plenty of high factor sun block, we suggest nothing lower than SPF 30 and zinc based block for your face.